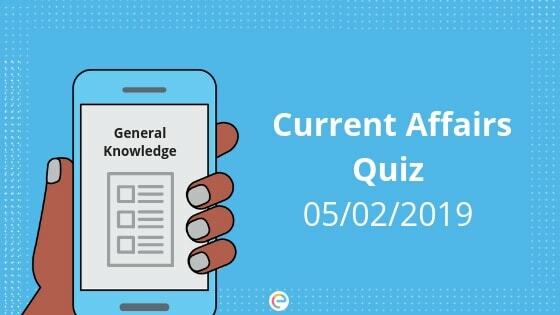 Current Affairs Quiz for February 5, 2019: This section covers the GK and Current Affairs quiz with daily MCQs on National Affairs, International Affairs, Economy, Banking Affairs, Polity, Geography, Environment, Sports etc. for competitive examinations viz. UPSC, SSC, Bank PO, Bank Clerk, IBPS, Railways, Government Jobs, UPPSC, MPSC, and other state exams. This current affairs quiz will help you in General Awareness section conducted in various Banking, SSC, Insurance, Railways, and other govt job entrance exams. Current affairs quiz will also help you outshine in the crowd with all the information you gain from this article. 1. “Smart Village Campaign” is approved by which of the following state governments? Explanation: The Punjab Government approved a rural development scheme “Smart Village Campaign” worth Rs 384.40 crore worth to supplement the ongoing works to build village infrastructure and provide essential amenities. 2. Which city launched the International Year of the Periodic Table of Chemical Elements? Explanation: The International Year of the Periodic Table of Chemical Elements will be launched at UNESCO’s Headquarters Paris. Events and activities will be held throughout the year to celebrate the 150th anniversary of the organization of the periodic table by Russian scientist Dmitri Mendeleev, one of the fathers of modern chemistry. 3. Who has acquired “Night Stay,” which offers deals on last-minute bookings at luxury hotels? Explanation: Paytm has launched hotel bookings on its platform and acquires Night Stay, which offers deals on last-minute bookings at luxury hotels. Its hotel partners include chains like Sarovar, Zuri, Treebo, Indian Hotels Co’s Ginger, Sterling and V Resorts. The company said it aims to reach 2 million hotels and alternative accommodations globally and become Asia’s top hotel-booking destination by 2020. 4. The World Cancer Day is celebrated every year on? Explanation: The World Cancer Day 2019 was observed across the world on February 4, 2019, with an aim to unite the world’s population in the fight against cancer. Cancer is the second leading cause of death globally and was responsible for 9.6 million deaths in 2018. 5. The United Nations Security Council has adopted a resolution 2454 to extend sanctions against which nation? Explanation: The United Nations Security Council has adopted a resolution to extend sanctions against the Central African Republic (CAR) for another year. Resolution 2454, adopted unanimously yesterday by the 15-member council, will renew the sanctions regime – an arms embargo, travel ban and asset freeze till January 31, 2020. Explanation: US President Donald Trump announced on February 1, 2019, that the United States will pull out of the three-decade-old Intermediate-Range Nuclear Forces (INF) treaty, which it had signed with Russia during the Cold War. 7. India’s unemployment rate has risen to what percentage during 2017-18 according to National Sample Survey Office(NSSO)? Explanation: India’s unemployment rate rose to a 45 year high during 2017-18. The assessment by the National Sample Survey Office(NSSO) conducted between July 2017-June 2018, showed the unemployment rate stood at 6.1 percent, the highest since 1972-73. 8. Who is the new official sponsor/partner for five years of International Cricket Council? Explanation: The ICC announced a five-year global partnership deal with beverage manufacturer Coca-Cola company. The partnership will see Coca-Cola’s brands becoming exclusive non-alcoholic beverage partners of the ICC until 2023. The five-year agreement includes all ICC events around the world including the ICC Men’s Cricket World Cup 2019 in England and Wales, the ICC men’s and women’s T20 World Cups in Australia in 2020, the ICC Women’s World Cup 2021 in New Zealand and the ICC Men’s Cricket World Cup in India in 2023 amongst other global tournaments. 9. Who is the first women cricketer to play 200 one day internationals? Explanation: Mithali Raj became the first ever women cricketer to play 200 one day internationals. She is an Indian cricketer and the captain of the Indian women’s cricket team in Tests and ODI. Often regarded as one of the greatest batswomen to have ever played the game, she is the highest run-scorer in women’s international cricket. 10. Which state’s government received the National Human Rights Commission notice over the death of laborers? 11. RBI has exempted Bank of India, Bank of Maharashtra and which other banks from Prompt Corrective Action Framework? Explanation: RBI has exempted Bank Of India, Bank of Maharashtra and oriental bank of Commerce from PCAF(Prompt Corrective Action Framework) following improvements in their capital position and asset quality in the December 2018 quarter. 12. “Kisan Suvidha Loan” for small and marginal farmers is a scheme by ____ bank. Explanation: Ujjivan Small Finance Bank(SFB) has announced the launch of “Kisan Suvidha Loan” for small and marginal farmers. The collateral-free loans can be used by farmers for both agriculture and allied activities. The bank commenced operations on 1 February 2017. Explanation: International Cricket Council CEO Dave Richardson announced that the 13th edition of Men’s Cricket World Cup will be played in India in 2023. This will be the first time the competition is held completely in India (three previous editions were partially hosted there – 1987, 1996, and 2011). 14. INSTEX, a payment channel is set up by Germany, France, the United Kingdom and which other country? Explanation: Germany, France and the UK have officially set up a payment channel with Iran called INSTEX to help continue trade and avoid US sanctions. The long-awaited special payment system will help save the Iran nuclear deal by allowing Tehran to keep trading with EU companies despite Washington re-imposing sanctions after US President Donald Trump had quit the accord in 2018. 15. Where is the headquarters of Paytm situated? Explanation: Paytm is headquartered at Noida. Paytm is an Indian e-commerce payment system and digital wallet company, based out of NOIDA SEZ, India. Paytm is available in 10 Indian languages and offers online use-cases like mobile recharges, utility bill payments, travel, movies, and events bookings as well as in-store payments at grocery stores, fruits and vegetable shops, restaurants, parking, tolls, pharmacies and education institutions with the Paytm QR code.